BELGIA, - At least 300 Hindu Indonesians coming from Belgium, the Netherlands, Germany, France, Ireland, and Italy have celebrated Saraswati Day at the Hindu Temple located in Pairi Daiza Recreation Park, Brugelette, Belgium, over the weekend. 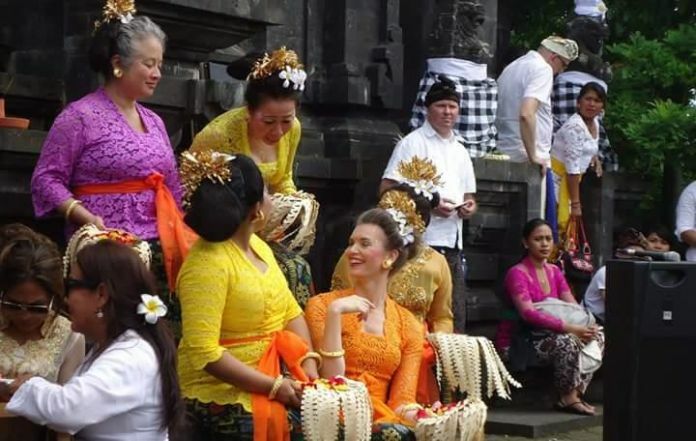 This celebration, in addition to followed by Hindu people of Indonesia, is also followed by visitors of Pairi Daiza Garden of Belgium who are interested in Balinese culture. First Secretary Ignatius Priambodo of the Embassy of Indonesia at Brussels, said to Antara in London on Monday (8/21/2017) that the morning prayer followed by Hindu celebrations enlivened the performance of Balinese music and dance. The Indonesian Ambassador to Belgium said the Hindu Indonesian community in Belgium and Europe should be able to continue to develop creativity and contribute to the promotion of science as per the meaning of Saraswati Day celebration. Ambassador Yuri invited visitors from Belgium to vacation in Indonesia and to attend various activities within the framework of the 2017 Europalia Festival in Belgium. The Europalia Festival is the largest cultural art show in Europe held in Belgium and the surrounding countries. This year Indonesia becomes a guest country and will be held more than 200 cultural arts activities such as exhibitions, music, dance, literature, cinema, and others that present more than 600 artists. Meanwhile, the chairman of Banjar Shantidarma in Belgium who is the organizer committee I Made Wardana told Antara London on Monday, Hindu community of Indonesia crowded the temple to perform prayers and the celebration together in solemn.